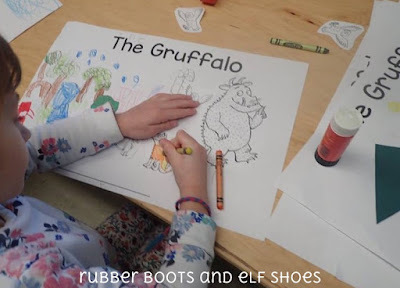 One of our favourite books is Julia Donaldson's The Gruffalo. All right - it's one of my favourite books - but my enthusiasm is contagious - so the kids love it too. 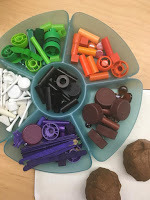 As well as being a perfect story for reading, watching (the BBCOne production is delightful), and retelling -- it is also a perfect story for learning story elements. 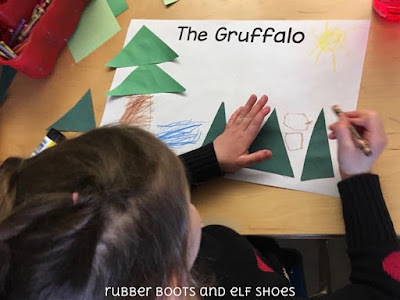 After a number of experiences and opportunities to enjoy and "play" with the story of The Gruffalo, we started chatting about the setting. Where does the story take place. Julia Donaldson makes that easy for us. A Mouse took a stroll through the Deep Dark Woods. We created a Deep Dark Woods. 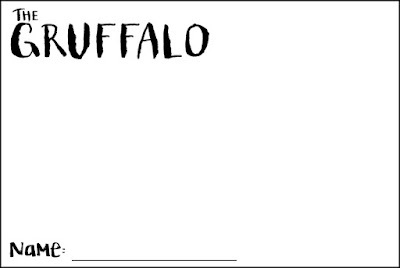 Click on the graphic to print it - I created it to be printed on 11 x 17" paper. 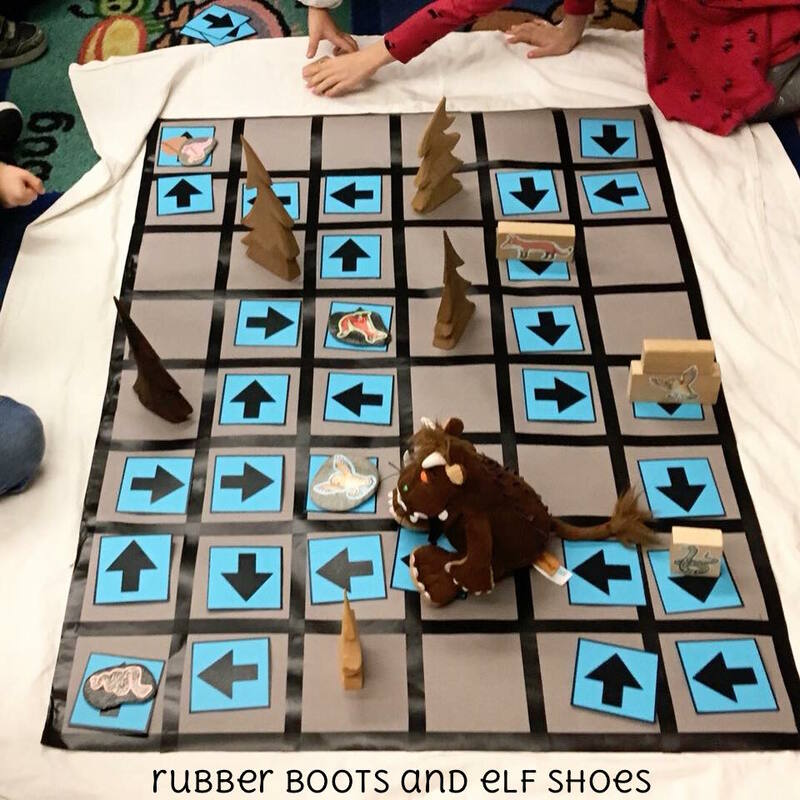 We talked about what needed to be in the Deep Dark Woods. Trees. Obviously. A stream. A logpile house. An underground house. 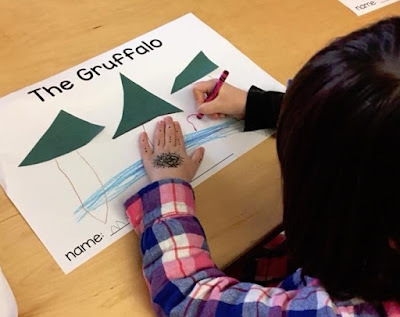 We used a combination of green paper and crayons to create the Deep Dark Woods. A setting needs characters to begin to make a story. 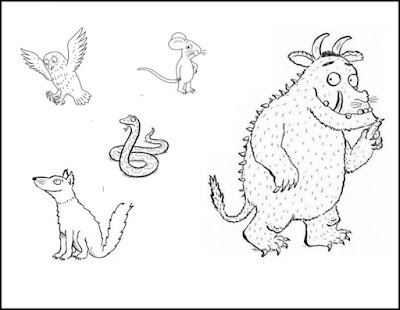 One again, The Gruffalo makes it easy: 2 main characters, and 3 supporting characters. Click below to print out the characters on letter size paper. I cut the characters out for the children since I wanted their energy and focus to go towards adding the character to the deep dark woods, rather than on cutting. 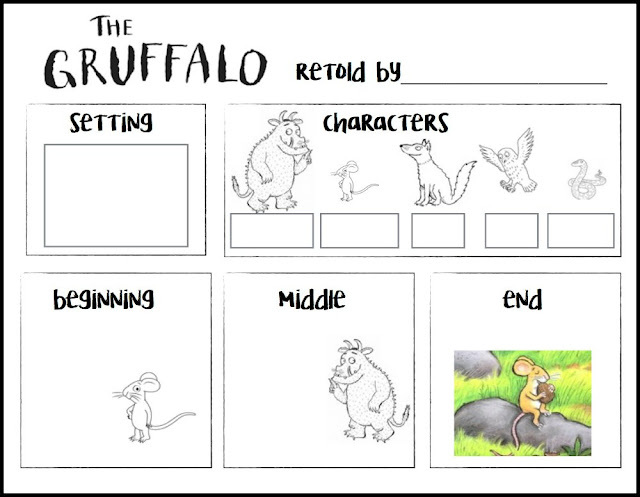 For our third lesson, we reviewed setting and characters, and added the plot. Click on the graphic below to print on letter sized paper. Or enlarge to tabloid if that works better for your children. Attached to the file is the setting and the character names to cut out and glue in the correct boxes. Or your students could print. 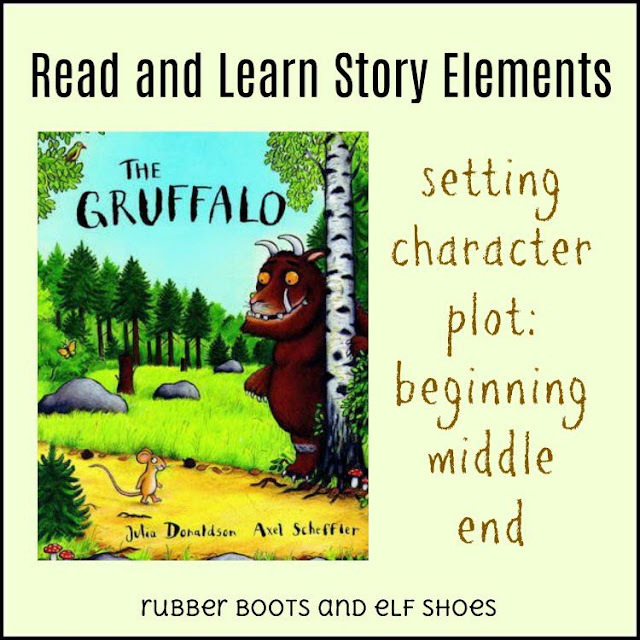 Summarizing a plot to its beginning, middle and end, is a difficult task for kindergarten kids. It requires summarizing skills - and that is hard for Littles. We figured out the beginning, middle and end as a class. (The graphics were a bit of a clue!) Older children could summarize individually or in groups, and/or do the printing themselves. 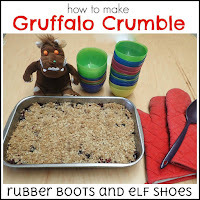 There is so much fun (and learning) to be had with The Gruffalo. This is awesome!! Love Love reading your blog. Thank you for providing such a wonderful look into your classroom and all the great things you do.